A grieving ad exec is manipulated into selling his stake in his company. Remove the dead kids and the premise could make for a great Trading Places style screwball comedy, but Collateral Beauty thinks it's a deep exploration of the human condition when it's really just It's a Wonderful Life, if Clarence pushed George off the bridge. It's always difficult to hold back a groan when a movie's title is vocalised by one of its characters. In the case of Collateral Beauty, doubly so. Not only is its title spoken several times, but it's a phrase entirely made up for the film, yet it expects the audience to immediately understand its meaning, never bothering to expand on the term. I took it to mean that even in the aftermath of a tragedy, life offers moments of beauty. But that's an extra-textual reading on my part, as beauty is nowhere to be found in this mess. Will Smith's ad exec Howard could use some collateral beauty. Grieving over the death of his daughter, he's retired from life, turning up at work and refusing to speak to any of his co-workers while creating elaborate domino displays, which he knocks down and walks away without even bothering to watch the fruits of his labour. I think this is meant as some kind of a metaphor (maybe we're all just dominoes? ), but it could just be that falling dominoes make for an interesting visual over to which to layer the movie's cloying score, which sounds a lot like the first four bars of U2's Where the Streets Have No Name played on repeat. Howard's behaviour has put his company in serious trouble, with his three partners - Whit (Edward Norton), Simon (Michael Pena) and Claire (Kate Winslet) - desperate to have him sell his stake so they can save their jobs and those of their many employees. If only Howard could be proven mentally incapable of holding his responsibilities, he would be forced to sell. It should be noted that Howard is so unstable he spends his nights cycling headlong into oncoming traffic, something the private investigator (Ann Dowd) the trio have hired seems to have overlooked. Instead, they come with an elaborate and deeply immoral plan. You see, Howard has been writing letters to three abstract concepts - Death, Love and Time - so his partners hire three struggling actors to play the roles of DLT, appearing to Howard at random and thus driving him insane. Yes, they're the Charles Boyer to his Ingrid Bergman. By an odd coincidence, the three partners are paired off with the actors playing roles that relate to their own lives. Whit wants to regain the affection of his strange daughter, and is paired with Keira Knightley's Love, whose advice essentially amounts to telling Whit he should simply harass his daughter until he breaks her down. Simon is dying - you can tell this because he coughs into a hanky - of an elaborately named disease, which suggests screenwriter Allan Loeb received a medical dictionary as a Christmas gift, and so is coupled with Helen Mirren's Death, who advises him to tell his wife of his condition before he pops his clogs. Claire is a successful businesswoman, but we all know women have no value other than sprouting sprogs, and so she's desperate to have a kid before a cuckoo pops its beak out of her biological clock, and so she hangs out with Jacob Latimore's Time, who tells her "A child doesn't have to come from you, it just has to go through you." Remarkably, that's not the worst line spoken in this movie; that award goes to Whit's description of his first time holding his infant daughter in his arms - "I wasn't just feeling love, I became love." Meanwhile, in between being driven to mental distraction, Howard begins to attend grief counselling sessions, striking up a relationship with Naomie Harris's Madeleine, who attempts to coerce him into accepting his lot and moving on. When your film's two most likeable characters are a man so selfish he's willing to risk dozens of other people's jobs, and a grief counsellor who unethically hits on the first handsome teary father that walks through her door, it's an indication your feelgood Christmas movie may not be firing on all cylinders. The film doesn't seem to realise just how sociopathic its many protagonists are. Remove the dead kids and the premise could make for a great Trading Places style screwball comedy, but Collateral Beauty thinks it's a deep exploration of the human condition when it's really just It's a Wonderful Life, if Clarence pushed George off the bridge. 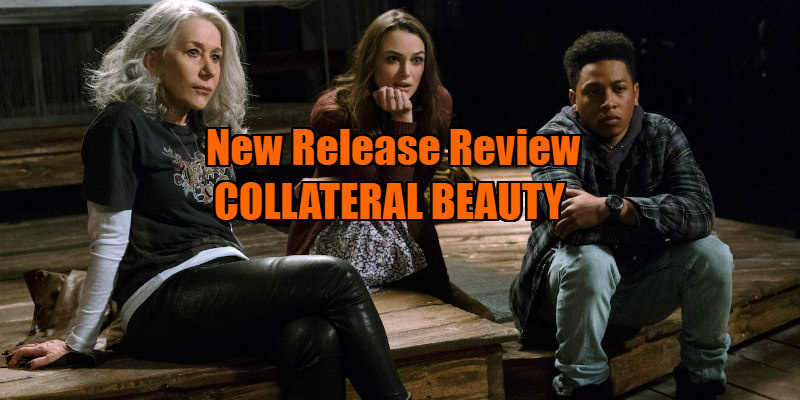 The marketing for Collateral Beauty has been understandably coy in selling its actual premise, so you may think I'm spoiling the movie here, but believe me I'm not. If I wanted to spoil the film I would discuss its double whammy of final act plot twists, which are so inconceivable, M Night Shyamalan would feel guilty about writing them. It's a testament to Will Smith's charisma that he manages to come out of this fiasco with an ounce of dignity intact, but he commits to his performance when all around him are clearly cashing cheques. Now beginning to lose those famous boyish looks, Time is running out for Smith, and if he keeps making such bad choices his career will suffer an untimely Death. But we still Love you Will. 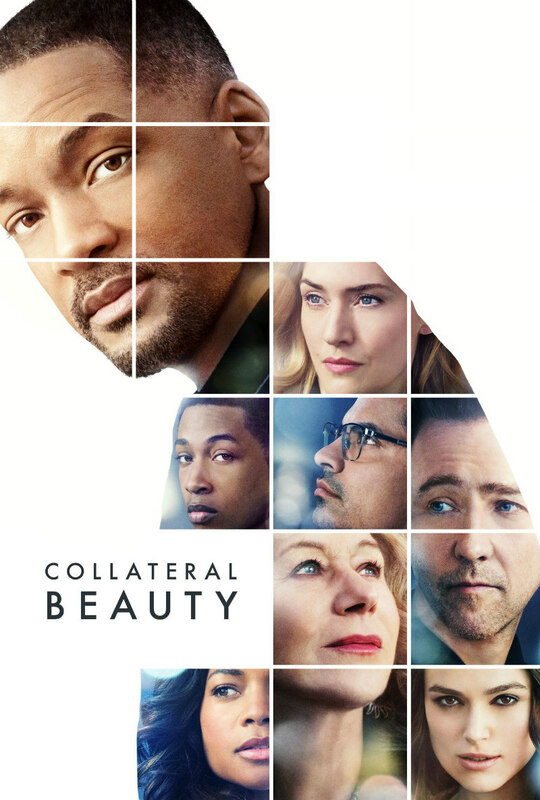 Collateral Beauty is in cinemas December 26th.